As much as I enjoy reading trademark infringement lawsuit complaints, even I will concede that they all pretty much read the same after a while – multiple paragraphs of factual allegations about trademark rights and infringing activities followed by paragraphs of causes of action (leave it to lawyers to take 20 pages to state what could probably be set forth in 5 pages and still be considered a sufficient “short and plain statement of a claim” for purposes of satisfying Rule 8). The lawsuit filed by Vienna Beef, Ltd. (“Vienna Beef”) against a Chicago restaurant, and its owner, Ferzi Emini, is no different. See Vienna Beef, Ltd. v. Freddy's Fast Food, Inc. et al, Case. No. 10-cv-04313 (N.D. Ill. July 12, 2010). (Complaint here). Vienna Beef is the owner of the registered trademark for VIENNA BEEF for various items including frankfurters, wieners, and polish sausage. According to the complaint, the Defendants’ restaurant, Freddy's Fast Food (located at 5364 W. Gale Street, Chicago, Illinois 60630) serves hot dogs and polish sausages. 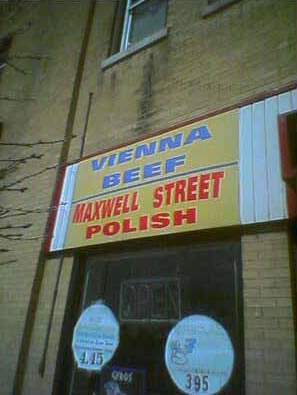 A purported picture of the exterior of the Defendants’ Restaurant showing a large sign displaying the mark VIENNA BEEF was included as an exhibit to the complaint. A Vienna Beef representative supposedly went to Defendants’ restaurant and observed that the restaurant was selling hot dogs and polish made by some other company (an unnamed Vienna Beef competitor). Which leads to the one factual allegation in this complaint that stands out among the other routine allegations (and makes this complaint a little unusual). According to the complaint, when the Vienna Beef representative notified Mr. Emini that his use of the VIENNA BEEF mark was not proper because he was not selling Vienna Beef products and that he must either begin selling genuine Vienna Beef products or else take down the sign, Mr. Emni “wielded a weapon, chased Vienna Beef’s representative from Defendants’ Restaurant, and threatened Vienna Beef’s representative with death or bodily harm.” [ed.—hmm, I wonder what kind of weapon? A deadly Kielbasa perhaps?] Naturally preferring to avoid any further confrontation, Vienna Beef followed-up with a formal cease and desist letter the next day [ed.—no police report?]. Defendants apparently refused to comply, promptly Vienna Beef to file the instant action. Vienna Beef maintains that Defendants, by promoting VIENNA BEEF and then selling hot dogs and polish sausages that are not genuine Vienna Beef products, are deceiving customers into believing that they are purchasing genuine VIENNA BEEF branded hot dogs and polish sausages, when, in fact, such customers are purchasing some other company’s brand of hot dogs and polish sausages.